LinkedIn couldn’t wait until the new year before launching new features of its iPhone app. So, before we all bid 2009 goodbye, here are some new features and enhancements of the LinkedIn iPhone app. First thing you’ll notice of course is the new home screen interface with the most common and important features of the LinkedIn app on top of the home screen – All Updates, Status, Profiles and Discussions. These options are arranged in a 4 by 3 square similar to the layout of Facebook app’s main screen. Next improvement is a completely revamped search interface that display search results faster than you can imagine. Likewise, the profile screens were also improved with summary of details about the LinkedIn member, review of their education and experience, list of people you both know in common and the ability to mark that person as a favorite. This Favorite feature would be most useful if you want a quick look on some of the most important people you’ve searched on LinkedIn. And then the LinkedIn app also makes it easier to check updates through four new modules – all updates, status udpates, profile updates and discussions. The app even allows you to filter updates based on your favorited connections. You can make comments on the updates as well. Other new features of the LinkedIn iPhone app include – more powerful inbox and Address Book Integration and a cool feature that lets you find and connect with LinkedIn members real-time in person through Bluetooth. Provided of course that the LinkedIn member is using the iPhone app also. 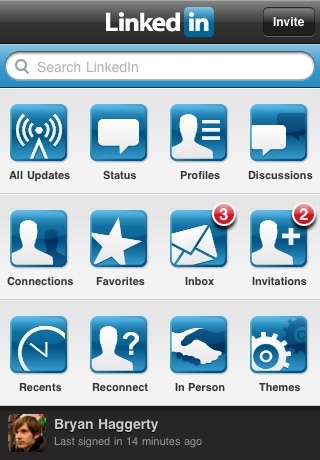 Alright folks, here’s the LinkedIn iPhone app download link.